There are some 90 construction sites in Lower Manhattan, according to Community Board 1, and as anyone who lives Downtown knows, they come with plenty of misery and complaints. At a recent forum that might well have been titled, “Everything You Always Wanted to Know About Construction Misery, But Had No One to Ask,” residents had the chance to directly question city agency officials about construction-related problems and what the city is—or isn’t—doing about them. Not surprisingly, the most frequently asked questions were about ubiquitous sidewalk sheds (aka “scaffolds”) and noisy late-night work. 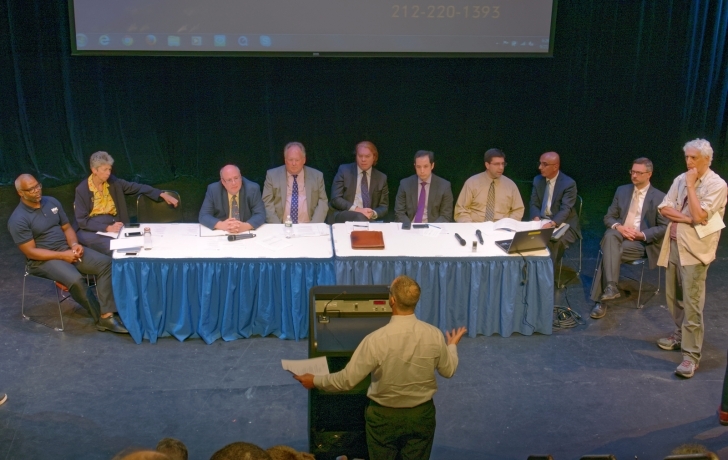 Pat Moore, chair of CB1's Quality of Life Committee, presided over the forum, which was sponsored by CB1 and elected officials. Below are some of those questions and answers, edited for brevity. Q. There is scaffolding that has been up for years. Owners keep renewing the permit and not doing the work on the building. Homeless people take up residence, and people generally feel unsafe at night walking under them. Why are they allowed to stay up? Patrick Wehle, Deputy Assistant Commissioner for External Affairs, Department of Buildings: As long as there is a condition on that facade that has the potential to imperil the safety of the public we need to make sure that there is a sidewalk shed in place. We realize all the potential effects that are associated with having a shed, be it blight, littering, loitering, vandalism, crime, how it hampers small businesses. There certainly are circumstances throughout the city where there are sheds in place for longer than the reasonable amount of time it takes to correct the condition on the facade. We do not have the authority to compel correction within a specific period of time. That’s the challenge we face. However, we’re trying to think about ways we can create disincentives so that the sidewalk shed isn’t up for any longer than it needs to be. But I want to inject a dose of reality here. Repairing facades often takes an enormous amount of money to do and owners are making a very rational economic decision to keep the shed up, renew their permits and not correct the condition. There’s a question as to what extent you can raise the fee so that it incentivizes owners to actually correct the condition in a quicker fashion. Q. Is there anything on the Department of Buildings web site that provides updated information on scaffolds and lets people know if they are part of an active site? Wehle: No. We don’t have any sort of measure that says you got your permit today, when did you start your work, when are you expecting to complete it? We don’t have that level of sophistication largely because each facade is different so it is a function of the size of the building and the type of work that’s necessary. Q. What can be done to promote the use of noise mitigation barriers for street work and what are you going to do to enforce existing noise regulations? Gerry Kelpin, Director of the Air and Noise Enforcement and Policy Unit, Dept. of Environmental Protection: Some sites have been mitigated a lot better than others. We try to visit the sites that we get complaints about. Street work is a very different animal. We have encouraged the use of different kinds of mitigation for street work but we’ve run into a huge amount of resistance based on safety. If you enclose the worker then they can’t be seen and can be hit by a car. So we have not been very successful with street work. We try to enforce sound limits for jackhammers by keeping them in check with their mufflers at standards that they’re supposed to be at. We try very hard with the projects that receive after-hours work permits to reduce those levels if we can or to try to not get their permits to be issued as frequently or for the periods of time that they are issued. It’s a totally uphill battle. Q. How late is jackhammering allowed, and how do you handle complaints about after-hours and weekend construction? Luis Sanchez, Manhattan Commissioner, City Department of Transportation: We allow jackhammering from 7 a.m. to 10 p.m. on weekdays, 9 a.m. to 6 p.m. on Saturday and 10 a.m. until 5 p.m. or 6 p.m. on Sundays. Sometimes contractors don’t stop at 10, they stop at 10:30, 11, 12. So unfortunately none of the agencies are around to witness that. We encourage people to call 311. We’ll get the complaint or call the respective agency so we can schedule an inspector to visit the site, say 11 o’clock. If they’re in violation we write them a citation. If the problem consistently occurs then we revoke the permits. Nighttime jackhammering is allowed if there’s an emergency, such as water main break or gas leak. Con Ed or the Department of Environmental Protection will work straight through until they fix the problem. The tough part is that the guy who comes in for one night project, he’s going to do it one night versus two or three nights. Kelpin: We see the complaints come through 311 in real time. They show up on our computers but in some cases we just don’t have the manpower to go out that particular day. But we do follow up if we see a pattern, and in the early mornings our staff is there. [Inspectors] also circulate through the city and if they see a project that has started before 7 a.m they stop and check it. If there is no permit we issue a violation. Byron Munoz, Liaison, Intergovernmental and Community Affairs, Department of Buildings: You can look at the Department of Buildings website, nyc.gov/buildings and check for after-hours variances for your location. So if you see work occurring at a certain address, write in the address and then click on the after-hours variance link. You can do the same at the DOT web site. http://www.nyc.gov/html/dot/html/home/home.shtml Click on street work permits and then check status of the active street construction permits for that address. If you find no permits for those two addresses then you go to Step 2, which is call 311. You describe the location, the time of day and the type of work that is occurring. After that you follow up with your elected officials or the community board so they can get in contact with the agencies and get an inspector to that location. Sanchez: We have an overnight crew of inspectors but they cover citywide. We try to schedule inspections based upon complaints so that we can follow up. Unfortunately, sometimes we do catch them, sometimes we don’t. Q. Can you ask to see permits? Sanchez: Yes, you can ask. Obviously contractors may feel they’re not required to show the permit but they should. You can call the precinct. They can investigate the noise complaint. If they don’t have a permit they can chase them out. Q. Is there any limit to how much construction can go on within a certain area? Martin Rebholz, Manhattan Commissioner, NYC Department of Buildings: For a privately sponsored project there’s no limitation with regard to the number of projects on any given block. That’s the nature of our building code and the nature of property ownership in the city. Q. How should I follow up with a 311 complaint? Noah Pfefferblit, CB1 district manager: The best way is by email. Provide a brief written description of the problem and a 311 complaint number. Don’t get too frustrated before you try to reach out to us and give us an opportunity to resolve whatever issue comes up. We think we do that very well. You can also call our community coordinator, Lucy Acevedo, at 212-669-7970. She can often make a referral to the appropriate place and get the problem resolved quickly. William Reda, Communications Director, NYC 311: It is important to report problems to 311 http://www1.nyc.gov/311/ because it’s a good way for agencies or elected officials to quantify the impact of an issue on a community. If you want to know what’s being filed in your community board or around the city you can go to 311 open data. Every day we update the web site to have all the complaints that were filed in the city for a particular topic. It’s a very powerful tool to tap into.